The Philadelphia Flyers announced that they have claimed 5’11”, 190-pound forward Patrick Thoresen (THOR-eh-sehn) on waivers from the Edmonton Oilers, according to club General Manager Paul Holmgren. In addition, the club announced that forward Claude Giroux had been reassigned to the Gatineau Olympiques of the Quebec Major Junior Hockey League. Thoresen, 24, recorded two goals and an assist for three points and six penalty minutes in 17 games for the Oilers this season. He also registered 13 goals and 13 assists for 26 points and 13 penalty minutes in 29 games for Edmonton’s American Hockey League affiliate, the Springfield Falcons. He is third on the Falcons in goals (13) and plus/minus (+6). In 85 career NHL games over the last two seasons with Edmonton, Thoresen has posted 19 points (6G,13) and 58 penalty minutes. In 68 regular season games for Edmonton last season, Thoresen registered four goals and 12 assists for 16 points and 52 penalty minutes. He also posted six points (1G,5A) and four penalty minutes in five games for the Wilkes-Barre/Scranton Penguins of the AHL. 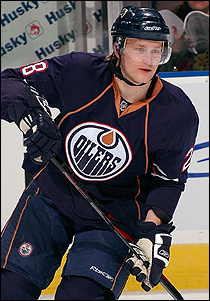 He was originally signed as a free agent by the Oilers on June 12, 2006. A native of Oslo, Norway, Thoresen played parts of three seasons with Djurgarden of the Swedish Elite League (2003-04 through 2005-06), recording 27 goals and 26 assists for 53 points and 79 penalty minutes in 83 games. He played two seasons in the QMJHL with the Moncton Wildcats (2001-02) and the Baie-Comeau Drakkar (2002-03), registering 63 goals and 118 assists for 181 points and 107 penalty minutes in 131 regular season games. He led the QMJHL in assists with 75 during the 2002-03 season. His 108 points during the 2002-03 season ranked third in the QMJHL. Giroux, 20, was scoreless in two games for the Flyers this season after being recalled from Gatineau on February 18. He has recorded 33 goals and 55 assists for 88 points and 31 penalty minutes in 47 regular season games for Gatineau this season. He was originally selected by the Flyers in the first round (22nd overall) of the 2006 NHL Entry Draft.